Our clinic is patient centered and we hope your experience exceeds your expectations. Just like fingerprints, all pain presentations are different; we like to take the time to learn about your presentation and your concerns. We want your visit at our clinic to be positive and relaxed and we will work with you to ensure you understand your presentation and the treatment we can offer you. The goal of chiropractic is to ensure the joints of your back and neck work well to allow your nervous system a very important control system in your body akin to the electrical system in a house do its thing and keep you well. Just like your teeth are exposed to everyday traumas and require routine dental checks to ensure they stay healthy, your spine is also exposed to everyday traumas and requires routine chiropractic checks to ensure it stays healthy. Traumas, be they physical, chemical or mental, be they sudden as in a bad lift or an accident, or be they slow as in sitting at a computer all day, all place stress and tension on your spine and surrounding muscles causing your muscles to contract and your joints to seize up irritating your nervous system. Sickness, lack of energy, stiffness, aches and pains are all signs that your nervous system isn’t functioning right. Chiropractic is a healthcare that specialises in the art and science of joint manipulation known as the adjustment, this entails the application of a very quick thrust to a joint in a specific direction allowing the joint return to its optimal motion pattern. At Cork Chiropractic Clinic we use an instrument called the Activator to adjust joints. When it comes to pain or feeling under par, chiropractic offers a very real, low risk, pain free, natural alternative to drugs and surgery and is suited to all age groups and body types. Whether you are an elite runner, a weekend gardener, an amateur sportsperson, a builder, or a person rehabilitating after a broken bone there are times when deep muscle therapy is very beneficial. At Cork Chiropractic Clinic we offer various therapies that address muscle and soft tissue problems with a particular emphasis on Graston Therapy. This is a novel, non-invasive treatment that addresses muscle and other soft tissue problems quickly and effectively and gives long lasting results to people who suffering from sports and non-sports related muscle and soft tissue problems. 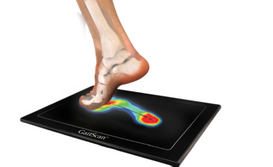 Many people think foot pain is normal as many people suffer from it but it is not! An orthotic is a custom made device that is worn inside the shoe and is designed to align the foot and ankle in a better anatomical position to allow better stability and balance. Most people walk between five and ten thousand steps a day and that is a lot of stress going up the legs and in to the back. A small problem in the workings of the foot can lead to big problems in other areas as they try to compensate, so good foot movement is important to help keep pain at bay. With the recent upsurge in running it is important that runners understand that the pressure on feet during running can be three to four times body weight so it is important that they look at their shoes and observe for any unusual wear pattern and seek advice in regard to same to avoid picking up lower limb running related problems. At Cork Chiropractic Clinic we work with The Orthotic Group, Canadas largest orthotic laboratory who provide orthotics that excel in comfort, construction and design. The Kinesio Taping® Method is a rehabilitative taping technique that is designed to facilitate the body’s natural healing process. 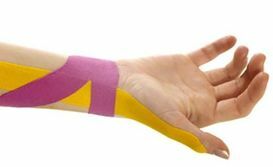 The tape is applied in a specific way in accordance with the patient’s exam findings and provides stability and support to muscles and joints without restricting their range of motion and so is the taping of choice for many athletes.